VeganBurg is the world’s first 100% vegan fast food chain, which was founded in 2010 in Singapore, with an additional and highly successful branch in San Francisco. Their food is mostly organic, made to order from scratch, is GMO-free and uses sustainable packaging. 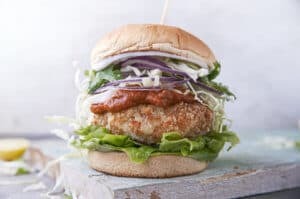 Last week, VeganBurg announced huge plans for expansion, with a planned 300 new locations in California and plans to go global with a franchising scheme. We spoke with founder and CEO Alex Tan about their exciting news. Can you introduce VeganBurg to readers in Europe and other markets who may not know your brand? VeganBurg, the world’s first 100% plant-based burger joint was founded on October 10, 2010 – a global plant-based revolution while inspiring a worldwide change. Since then, we have been redefining food pop culture and comfort food with its delectable 100% plant-based menu. We’ve been successfully pushing the limit and breaking the stereotype of how a burger should look and taste like – by mixing and matching colourful ingredients, plant-based burgers with daring flavours and gourmet sauces. Signature fan favorites include the Creamy Shrooms Burger, Seaweed Fries , and Sizzling Broccoli. Could you let us know about the association with Paul McCartney’s Meatfree Monday scheme and how it came about? Back in 2012, VeganBurg was voted by Sir Paul McCartney’s Meat Free Monday as a “Favourite Fast Food Joint” as we are the world’s first 100% plant-based burger joint. In your opinion, why should the fast food industry continue to acknowledge veganism? I believe that the food industry should roll up its sleeves and start offering more and more vegan options. Veganism is not just a fringe movement anymore. It is the biggest food trend this year and it’s not showing any signs of slowing down. Consumers nowadays are getting more and more invested in what they eat, how they eat, and how their purchasing power can make a difference. And to be completely honest with you, the majority of our customers are not even vegan – they want to try something new and reduce their carbon footprint. The fast food system is here to stay, we just need to change what goes into it. What are your plans for the end of 2018 and 2019? We have big plans for 2018 and 2019. Three things. First, we’re ramping up our franchising. We’re targeting 300 stores for California and looking for a master franchise in South East Asia, especially in Malaysia and Indonesia. Our aim is to solidify our franchise system and bring it to the rest of the world. Please tell us about your plans for expansion across the US – what is the USP that has given you such success and enabled such big plans? We are rolling out our expansion with strategic partners and like-minded investors in a big way. Starting with raising funds to ramp up our R&D and supply chain. We’re also exploring expansion plans with technology partners. At the moment, we’re offering single-unit and multi-unit franchise in California. However, we’re not sure yet if the same model will be applied for the rest of the country. And as for the success of the brand, let’s face it – everyone wants great buns in their hands – people want great tasting burgers! And that’s what we’re all about. We have invested 8 years in perfecting the ultimate plant-based burger recipe and concept that’s why we’re here. Our main focus is to provide the best burger that they’ve ever tasted. Simply put, our burgers appeal to a broader market. We are the only burger brand that has the East meets West – best of both worlds factor. We make an appealing global brand. Do you have a company mission, or what are you striving for? Our mission is to inspire and excite the world to choose a plant-based burger as a form of sustainable living for many generations to come. We are striving to make veganism mainstream. How do you foresee the plans for franchising and how far would you like to expand? As early as now, we’ve already seen a huge spike in interest for franchising. We get expressions of interest by the hour and at the rate that we’re going, it looks like we’ll be stretching our branches outside California soon, and outside the United States not long after. Our team in San Francisco is ready to support multiple single unit franchisee. We are building our team in Southern California next to support the expansion. At the moment, it’s definitely a Herculean task matching with the right business partners. We’re very particular on who we work with as this has a direct impact on the brand. We’ve already made it work in Singapore. And now, we want to make the franchise to work astoundingly well in California before we team up with a master franchisee so that we can bring VeganBurg to the rest of the nation. We’re talking about New York, Seattle, Texas, and all the other prime spots. We’d like to expand across the United States and around the world, of course. We’re here to change the landscape of the food industry for the better. Where do you see VeganBurg in the next five years? Our focus is to expand our presence in the U.S. market in the next 5 years. This will help us establish a foundation that will help us see through our vision and mission in a market where veganism is moving from marginal to mainstream. Customers can expect bigger, bolder, and more innovative flavours, made with fresh, natural and wholesome ingredients, and more mobilized services. We want as many people as possible to enjoy fast food that is both sustainable and delicious. And who knows, maybe 5 years from now, we’ll be saying g’day in Australia and hanging out with new mates in England.